With this garden we really wanted to give it a modern feel, and you couldn’t get more modern than this award-winning geodesic dome from Solardome Industries. As Cornwall has one of the most famous geodesic domes in the world and with the garden based in Cornwall, this was the perfect location to gain influence from the Eden Project down the road. 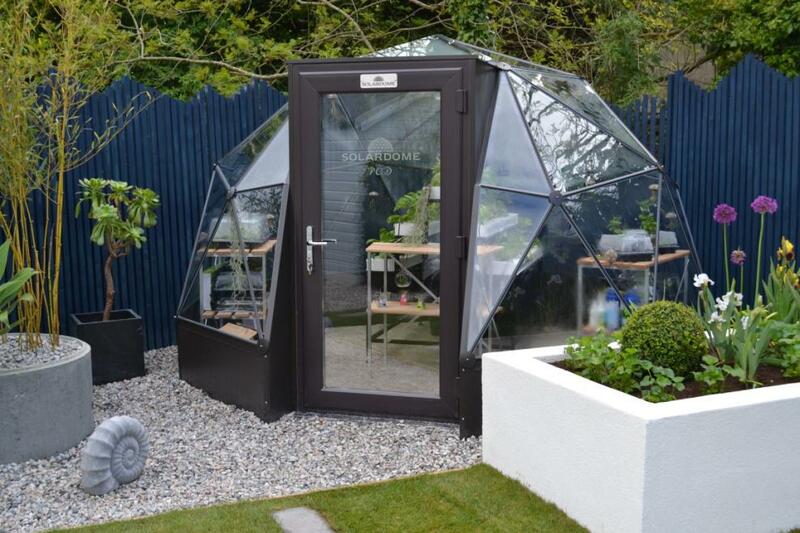 This POD dome looks so good that it is a great focal point in the garden and it’s practical too. Each glass dome that Solardome Industries produce is engineered using the finest British-made materials and latest indoor growing know-how. Chris and the family can take full advantage of the advanced shape to maximize solar exposure all year round and with Cornwall being one of the sunniest counties in the Britain, this is perfect for Chris to expand on his garden skills. The Solardome guys who came to construct the dome were great too. The entire dome took just over a day to have up and running for us to use. The only thing we had to provide was the level concrete base for the POD to attach too. These geodesic domes come in a white colour as standard however; you can ask the nice people at Solardome Industries to powder coat the dome in colour of your choice. We went for a dark colour so there was a contrast in colours from the raised beds. As we used grey linear paving in this garden we wanted a product that would complement the paving. The Earthwood EasyClean Silver Maple composite decking from TimberTech was the perfect choice for this. With its clean sleek look it really does shout modern living. As well as looking fantastic this product has a greater life span compared to its wooden rivals and has little to no maintenance, another plus as the Finney’s have three young children to entertain and a garden centre to run. This capped composite decking comes with authentic graining to give it that natural hardwood style but is scratch, stain and fade resistant – it even comes with a 25 year warranty. This decking can handle anything you or nature can throw at it – whether you spill wine or BBQ stains get onto the decking, a simple wipe clean and the decking looks new again. The other added benefit of composite is there are no splinters for anyone especially for the little ones. As with any type of decking the first stage was to make a framework for the boards to sit upon. This was simple to do and did not take up too much time. Once the framework was prepared the boards went down rapidly using a neat hidden fastener system to achieve that modern clean look that we wanted. TimberTech were so kind that they gave us enough boards to enable us to make the seating, a table and even the ball pits out of the decking, which finished the area with a unified feel. We all like the relaxing sound of water in a garden and here at Love Your Garden we wanted to find something a little different when it came to our water feature. 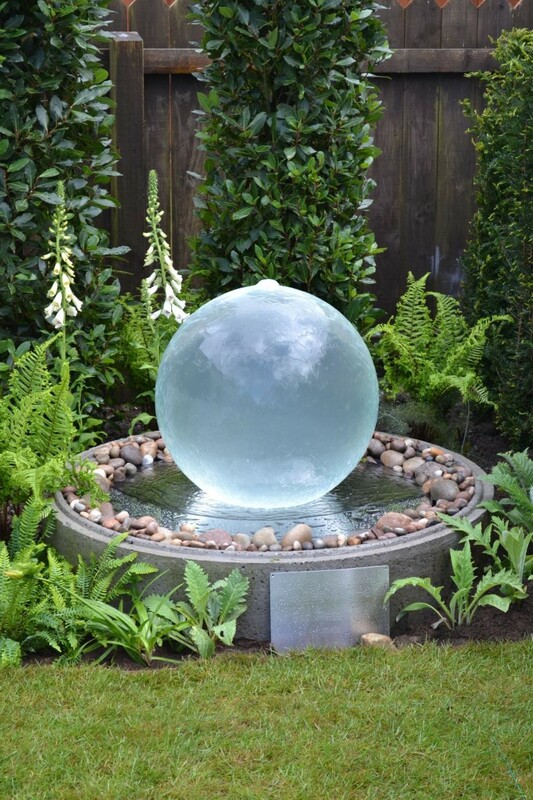 Aqua Globe produces these beautiful acrylic spheres which break the mould in ornamental water features. With this spherical water feature the strong straight lines of the raised beds contrast but complement each other with their modern style. Aqua Globe do provide the reservoir casing if you so wish but here at Love Your Garden we wanted to give the Finney family something a bit more funky. We used a concrete drainage ring to house the reservoir and topped it off with a metal disc, which when put together looks stunningly modern. This water feature will act as a good focal point for the Finney family when they are enjoying their garden sat in the decking area or even on their new patio. With the added metal plaque for that personal touch this contemporary sphere sits incredibly well within its environment. Aqua Globe can do the same as this acrylic sphere in granite or even steel and they can come in a range of sizes. We went for the 600m diameter globe for this garden and the fun doesn’t stop there; for that extra bit of design flare the globe lights up at night. Modern life is getting faster paced and finding time for one’s self is decreasing and when you do find yourself with time to spare you don’t want to spend it mowing your grass. Chris and Liz are caught up in this modern life running a garden centre and then looking after three children. 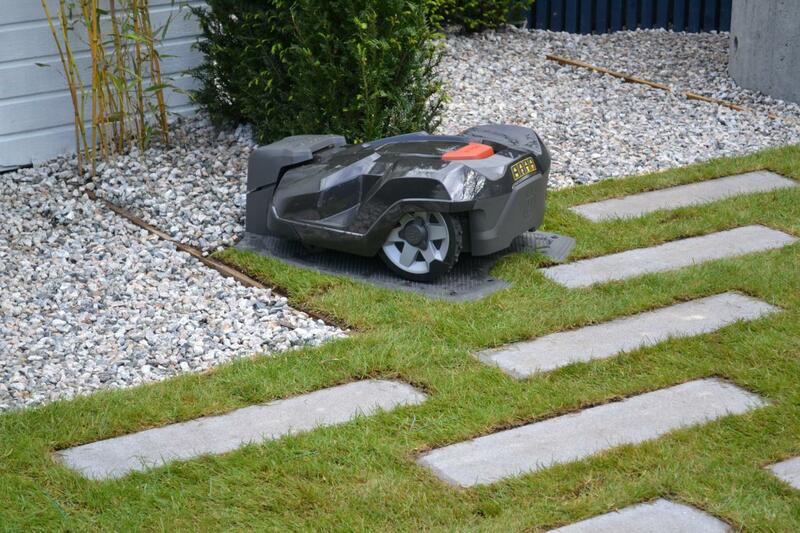 This is where Husqvarna stepped up to the challenge and produced the Automower 330X. This robotic mower takes on all the hard work of keeping the lawn looking sharp without any supervision. This little mower can mow during any weather and can tackle rough terrain and slopes up to 45%. The mower was installed by a friendly Husqvarna engineer after we had prepared the ground. A sensory wire was put all the way around the circumference of the lawn area, which you cannot see. This wire tells the mower not to go outside of this area and when the mower meets an obstacle it stops and redirects itself. You can even tell the mower what to do with your phone. The mower has a weather timer that adjusts the mowing to match the growth speed of your lawn and you can adjust the height of your own grass length manually or electrically. The Finney family will never have an excuse for not mowing the grass now and having a fantastic lawn. Futuristic and modern was the feel for this episode and we thought with its clean lines and smooth look this silicone render was spot on. Chris and Liz both have busy lives and having a low maintenance garden was key. There are many benefits for having raised beds in a garden, good drainage, you can control the soil type more easily, you can bring plants up to a different level, and the most important in this garden, the little ones cannot walk through you flower beds. The raised beds were made into L shapes to help frame the garden and to add that geometric design to the space. The beds were constructed using dense breeze blocks which you can get from any good building supplier. A rough coat of render was applied to the block with beading mess to help the top coat from cracking and bonding. The top coat is a silicone ready to use organic resin render which provides a low maintenance textured finish, and it looks stunning in this garden. You do not need to paint this render as it comes in the fresh white colour. As we used white we did have to waterproof the internal walls to stop water marks coming through the block. 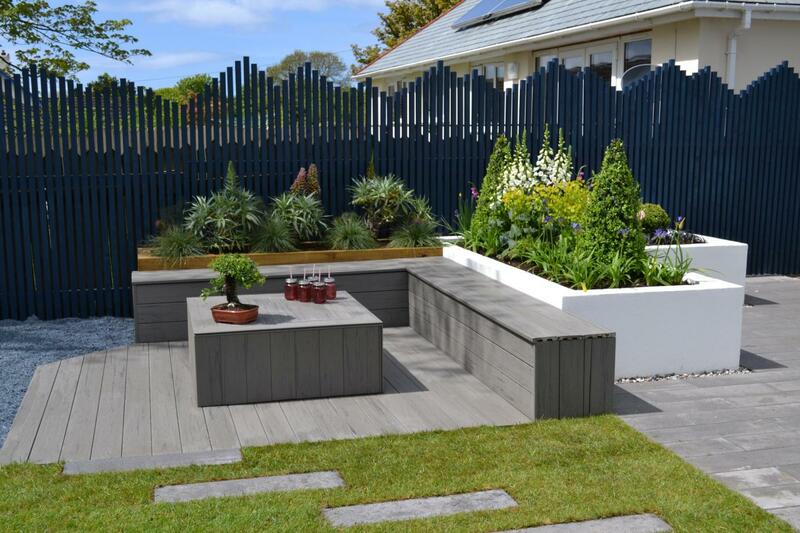 As you can see K-rend did a beautiful job with these raised beds and the contemporary look really does set the tone for this modern garden.